The Pittsburgh Penguins acquired Marian Hossa from the Atlanta Thrashers last week in an effort to bolster their championship hopes. Those aspirations, however, hit a snag immediately when the right wing suffered an injury in his first game with his new team. With Hossa sidelined, the Penguins hope to avoid a third straight loss Sunday when they face the struggling Thrashers for the first time since the deal. The Penguins (36-23-7) are fifth in the Eastern Conference, two points behind first-place Montreal. They hoped getting Hossa in a blockbuster five-player trade from Atlanta (29-31-6) prior to Tuesday's trade deadline would be enough to solidify their lineup and help them make a push for the top spot in the conference. Unfortunately, the high-scoring forward was ruled out for a week after injuring his right knee in a collision with Boston's Glen Murray while making his team debut in Thursday's 5-1 loss to the Bruins. The Penguins didn't fare much better without Hossa on Saturday, falling 5-4 at Ottawa for their fourth loss in five games. They last dropped three contests in a row during a season-high four-game slide from Nov. 7-12. "I think we're still playing pretty good and in games like this we're getting bad breaks," Penguins center Maxime Talbot said. "We've got a lot of guys down but we're playing well. It's not like we're getting outworked and outmuscled." Pittsburgh is still without reigning MVP Sidney Crosby, who suffered a high ankle sprain Jan. 18. The superstar center is still not prepared to return, so the team is looking to Evgeni Malkin to help it withstand another absence in Hossa. Malkin, the NHL leader with 87 points, has been outstanding since Crosby was ruled out for 6-to-8 weeks. He has 14 goals and 21 assists in 20 games since Crosby's injury, including a goal and two assists against the Senators. Malkin has been held off the scoresheet four times in that span, one of those occasions coming in a 4-1 loss at Atlanta on Jan. 30. He has only managed one assist in three meetings (1-1-1) with the Thrashers this season. Ty Conklin is coming off another disappointing performance, stopping 25 of 30 shots Saturday after he was pulled early in the second period at Boston for giving up three goals on 13 shots. That came after he had a career-high 50 saves in a 4-2 win over the New York Islanders hours after the Pens landed Hossa. Conklin is 0-1-1 with a 3.31 goals-against average in the last two games against Atlanta. The Thrashers hope to avoid a seven-game losing streak for the first time since Jan. 19-Feb. 3, 2006. Their slide reached six games (0-4-2) Saturday with a 3-2 shootout loss at Boston. Ilya Kovalchuk, second in the league with 42 goals and Atlanta's leader with 71 points, is looking for some consistent scoring after converting a penalty shot and failing to score in the shootout. The All-Star left wing has scored only three times in the last 10 games. Kovalchuk has a goal in each of the last two games against Pittsburgh, giving him 17 goals and 13 assists in 22 matchups. 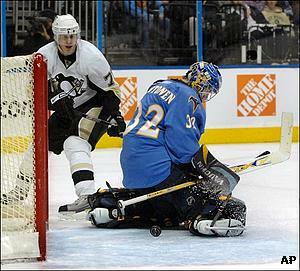 However, he has been held pointless in three consecutive contests at Mellon Arena, including a 5-0 loss on Nov. 24.